If you have any form of debt then you know how difficult it is to get out of the trap of using credit, because of the amount of your income you need to pay back the debt, plus the interest. There are ways to help you become debt free but it does take hard work and commitment to see it through to the very end. What is rewarding is knowing that the money you earn will no longer need to go to the credit companies, you get to keep more of your money and it will go further too. The most important step that you must take is being honest about the debt that you have. It is difficult sometimes to see all the money owed to credit companies or even just to friends. However, admitting the actual extent of the problem is going to mean that you are facing the situation and taking the steps to become debt free. 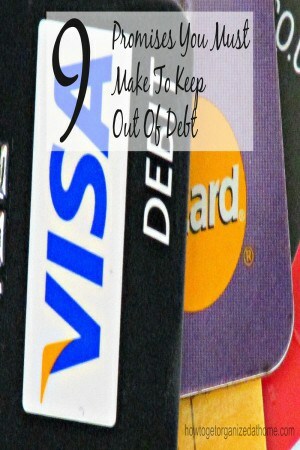 It is hard but it is important that if you want to become debt free, then you stop spending on any form of credit. This only adds to the problem and increases the amount of money that you owe and the length of time, which it takes to become debt free. You must create a budget; it’s the only way to work out the amount of money that you have coming in, the money that you need to pay your bills and what you have left. The concept of a budget is easy; the problems arise when you try to implement the budget. Take time, it is hard but worth it in the end. Don’t buckle to peer pressure to spend money that you haven’t got. It is tough when friends want to spend money and you haven’t got any, what you don’t know is the amount of money they owe to credit companies; they might be glad that your reduced spending helps them to sort out their finances too. You must create some sort of debt reduction plan, there are different options available that all help to focus your mind onto the debts that you have and to work out a system, which will help to pay off this debt as quickly as possible. Learn those triggers that can send you off into a spending spree. If you have a coffee on the way to work, then take one with you rather than stopping and buying one. Coping and facing debt on your own is scary, see if you can find someone to talk to, it is not a burden that you can’t share. If you haven’t a close friend or family member you can talk to, then try to find someone to talk, they could be a charity that specializes in debt; what you don’t want is to add more debt so be careful who you approach. For example, your bank might seem a good place but the staff have targets to meet and products to sell and their advice might not help your situation but make it worse. To know that there is an end in sight; if you have your debt reduction plan sorted, you will know that it isn’t forever. Not giving up, it is tough, there is hard work that you will have to deal with but it is possible to become debt free. It is difficult to break free from the cycle of debt, society throws credit at everyone at every opportunity and what it does is to create a state of reliance of these credit companies to live; you become trapped in a cycle of debt and paying vast amounts of interest. It isn’t easy but it is possible to break this cycle but it takes hard work and commitment to succeed. There will be tests along the way; they will try to break you. However, it is possible to break this cycle and live a debt free life. If you are looking for more articles on this topic head over to the landing page where you will find a link to other posts on debt and credit. Yep. Just week I was sooo tempted to put a new bed on credit. But I didn’t have the down payment in my account, so I had to walk away. Best thing for me. Having a week to think it over reminded me that I don’t want to pay twice as much for that bed.